K & C Fisheries Global Pty Ltd provide a wide range of high quality products tailored to meet the customer’s needs in both the domestic and export markets. Carp has been a fish traditionally used in the Jewish market as a kosher fish and K & C Fisheries Global Pty Ltd is able to support and supply this market. K & C Fisheries Global Pty Ltd delivers the Roe product in chilled/salted form, as opposed to the frozen format as supplied by other suppliers. This saves the client approximately two days of production time in the defrosting and preparation (washing and seperating) of the frozen product. The chilled product eliminates the risk of loss of quality and of the benifit to the client with the reduction of production time. The product is packaged in enviromentally considerate reusable plastic pails. These plastic pales provide an additional product to the client to on sell to farmers for seal feed bins and water buckets. The photos show the difference in quality and presentation to that of Australia. Both products are basicaly salted fish Roe in a mayonaise base. The Taramas is the oringal greek recipy of approx 12,000 years. 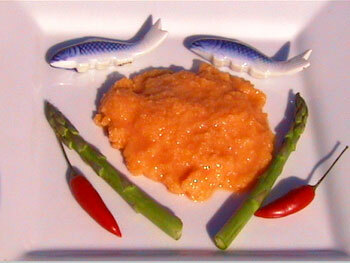 It actualy highlights the Carp roe (Eggs). 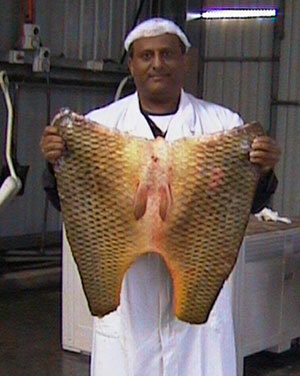 The milt (Male gonad) is removed from the Carp, washed and frozen in either 500gram packets or in packets of 250 grams of milt and 250 grams of washed Roe. This format of product is mainly used in Chechoslovakia. It is either made into a traditional soup for Christmas day lunch or fried or poached. Prague alone uses 80 tons just on Christmas day. 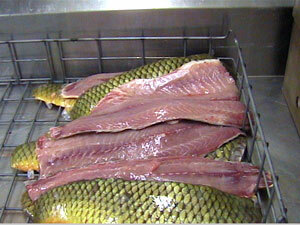 Fillets are commonly supplied into Europe for the resturant or domestic market. Some fillets are used in the canning market in Europe and the middle East. The skins from the fillets are used in the process of leather making. These products range from purses, wallets, key rings through to compodiums and clothes. Trunks are Carp that have been gutted and had the head and tail removed. • Canning market (Trunks from 800 gramms to 1500 grams). These fish are thawed and cut into cutlets steamed, placed into a can with some vegitables and the lidded and retorted to sterilize and preserve them. Link to photo. This is the traditional way for many Eropeans to eat fish. • These markets are mainly in the middle East and Europe. When ordering they usually order in the versinity of 400 tons at a time. The main markets for scales are the hobby markets for decoration and the paint Industry. The fish scales supply some formats of the efflorecence of some paints (Cats eyes on the roads). The scales are very good for creating artifical roses in craft work. The puturatary Glands have been used in the aquaculture industry for thousands of years. Theyare used as hormone drugs to help with the stimuulation of females to spawn. 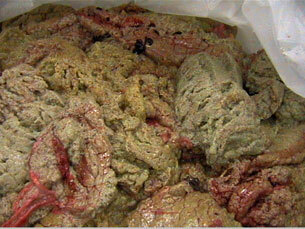 The puturatuary is removed from the base of the brain and preserved in accetone and then dried . 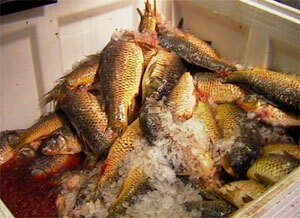 Carp makes a very good Bait for other fish due to its oilyness. It is very good in the salt water because the sea lice don’t attack it as much as salt water fish. Or other re blooded animal baits. The larger carp are much better than the small Carp as they have a much courser and tuffer flesh. The common markets for these are the commercial crayfish industry and the recreational angling market. Due to the fact that Carp Europe, Asia and the middle East is used mainly for Human comsumption not much in those areas is used for fertilizer. The fact that Australians did not have that same appreciation of carp and saw it as a pest gave the oppurtunity to develope fertilizers from it. 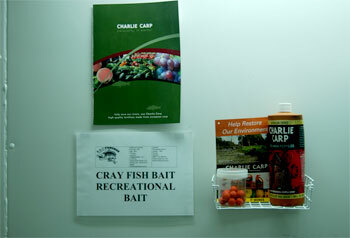 This gave way to Carp being the basis of the one of Australias best known liquid fertilizers, Charlie Carp. 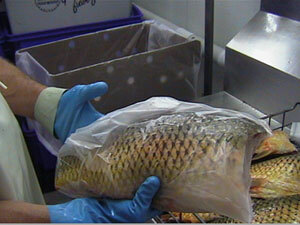 All Carp used in this process are treated at the same standard as for human consumption. You can’t use a rotten resource to make a top quality product. Over a period of 14 years K & C Fisheries Global Pty Ltd has been working with another company on the development of some Animal Food Suppliments. With lots of trials being run over the past years it has proven to be a very economical product for the increase in animal growth management without the use of any hormone drugs or similar. 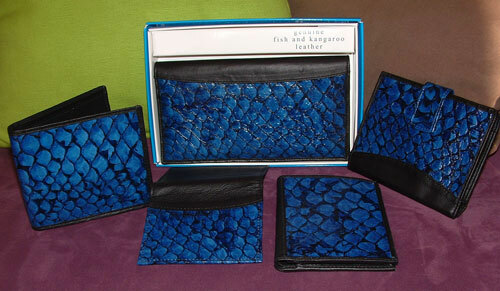 Carp leather is made from the skin of the fish. It is approx 6 times stronger than cow hide. Theprocess of tanning Carp skin takes approx 8 weeks from the time the skin is removed from the fish until it passed onto the leather maker to turn it into a high quality article such as a hand bag, purse, wallet, key rings and many more.